“I suppose you want a bedtime story tonight?” Mac glanced at Ian, who sat scratching his tail. “Only if you want to, Mac.” Ian’s bottom lip pouted. “His name was Patches. He sailed the seven seas with a gang of cutthroat pirates, the meanest, ugliest bunch of pirates the world ever knew. The captain of the ship, The Forest Zephyr, was known as Captain Whiskers. Captain Whiskers didn’t take much of a liking to Patches. Not very often were raccoons allowed on ships, but because Patches was so ugly and so mean and cussed so much, Captain Whiskers allowed him to work in the crow’s nest. 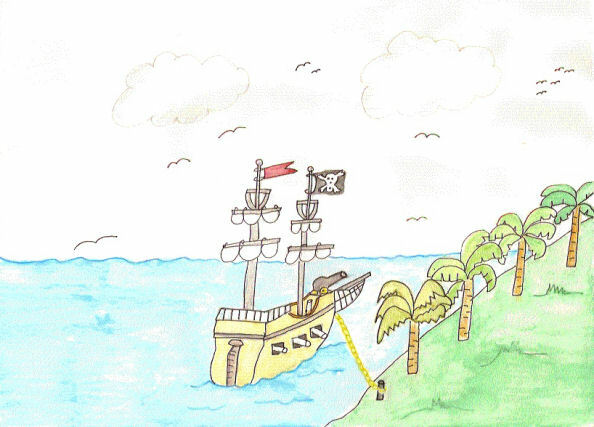 Each morning he’d climb the mast to the top and watch out for other pirate ships. One day Patches saw another ship coming their direction. He called down to Captain Whiskers. The skull and crossbones flag was raised and the pirates got ready for battle. Being up in the crow’s nest isn’t very safe. If a cannonball hits the mast and it falls, whoever is in the crow’s nest goes tumbling into the sea. That’s just what happened. It was a Scottish war ship on its way to battle. 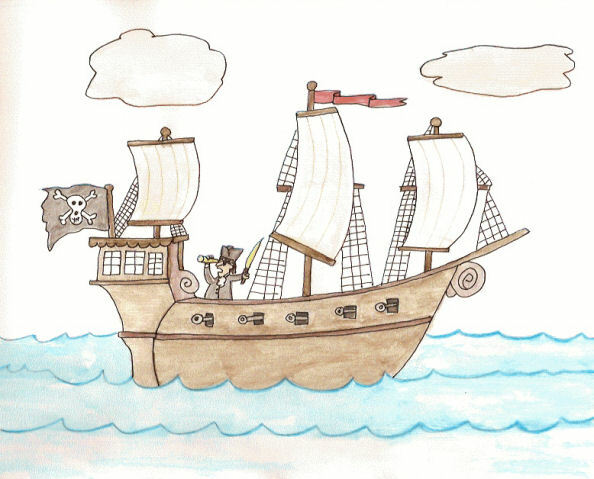 The last thing it needed was a pirate ship in their way; so they shot their cannon and vroom, whap, shoosh; cannonballs went flying everywhere, whizzing past Patches. He crouched, keeping low. Suddenly a cannonball hit the mast. Crackle, crunch, break! There went the mast. It broke in half and the top part fell sideways. Patches clung to the crow’s nest as it sailed over the deck. He landed in the sea. The waves pounded over him. He held onto the mast and the current carried him to an island. “What treasure? You never mentioned treasure before,” Ian said. “Oh. That explains it. Go on.” Ian yawned. “Patches dug in the sand until his back ached. His fur was coated with granules and he could hardly lift the shovel. Captain Whiskers walked over to the hole, grabbed Patches by the back of his neck and flung him across the sand. He dropped his chest of gold and jewels into the hole and then told Patches to bury it. Patches was so tired. He shoveled sand on top of the chest until it was covered. He was so tired that he lay down and snoozed. When he woke up, the ship was gone. They’d abandoned him. Patches found a coconut palm and filled up on coconut milk and meat and then he felt better. Since Captain Whiskered had taken the shovel when he sailed away, Patches dug up the treasure with his hands and pulled out the chest of jewels onto the sand. He opened it and his eyes bulged when he saw how much there was. He dragged the chest behind a tree and then wandered off to see how big the island was. Well, it turns out it wasn’t an island after all. There was a village not far off on the other side. Patches ran down to the chest and took out a few jewels and gold coins. He ran to the village and found the bakery. He bought every kind of pastry and pie he could and then sat behind the shop and ate it all. Each day he took some of the jewels and gold and bought food. One day he bought meat pies and sausage rolls. Another day he bought gammon steak and steak and kidney pies. “Argh, matey, ye land lubber. How dare ye doubt me.” Mac snarled at his friend. Ian shrugged his shoulders and then closed his eyes.